What do I do if the product I want isn’t available? What is the difference between shipping and billing details? How do I change them? I am not sure what size I should pick. I bought an Official Sporting shirt at Sportzone and I want to customize it. Can you add my name and a number to these products? Are the letters and numbers stamped on shirts the same as the ones the players use? Can I personalise any item? What payment methods are available in the Loja Verde Online Store? I am a Member, do I have a discount? How is the discount applied? How do I validate my Member discount? I can’t validate my Member discount, what should I do? 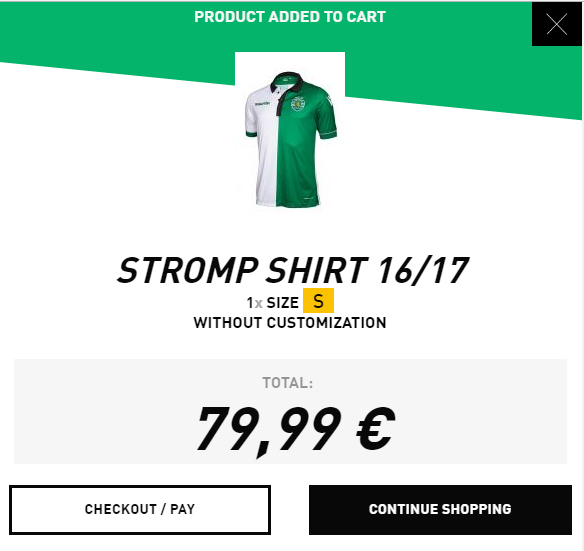 Can I pick up my order at the Loja Verde Official Store in Estádio José Alvalade? Can I change my delivery address after payment? Can I choose a delivery date for my order? What happens if nobody is around to receive my order at the indicated address? I still haven’t received my order. Why has my order been considered as not delivered? My order is incorrect or has defects. My order was damaged during shipping. I refused delivery and the order is going to be returned to Sporting Clube de Portugal. Are there any rules/restrictions which I should know about? Can I receive my order at a different address from my billing address? Can I exchange or return products purchased from the Loja Verde Online Store? Who is responsible for paying the shipping costs of exchanges and returns? When will I receive my exchanged product? In what conditions should I send exchanges or returns? Can I exchange or refund items at the Loja Verde Official Club Store at the stadium? Can I exchange or return any product? How do I register in the Loja Verde Online Store? Can I change my registration details later? Can I see my previous bills? 1. Visit our Loja Verde Online Store and add the products you want to your shopping cart. 2. After choosing the products you want, you can click on the image of the shopping cart in the top right corner, or click CHECKOUT – PAY after adding your last product to the shopping cart. 3. Review your products and click Next Step. 4. If you are registered and logged in Loja Verde Online Store, your shipping and billing details will automatically appear. You can also complete your purchase if you are not registered by filling in your details. 5. Select your shipping and payment method and confirm your delivery and billing address(es). 6. Click on Finish Order. If the product you want isn’t available in the Loja Verde Online Store, a message will appear saying “Sold out”, and it’s not possible to proceed to checkout. This means that the product is temporarily out of stock and cannot be ordered at this time. However, you can add the product to your Wish List and check later for stock avalilability. If you have any questions about the availability of a product, you can contact us at apoiolojaonline@sporting.pt. Yes, all prices in the Loja Verde Online Store already include VAT at the legally applicable rate. Shipping details correspond to the address where your order will be delivered. Billing details are used for paying for your order. You can change these details in the Customer Area, where you can predefine addresses to be used for Shipping and Billing through the Manage Addresses tab. After clicking on your shopping cart, you will see a field called PROMOTIONAL CODE, where you can add your code. After adding your code, clink on Add promotional code and it will be automatically validated against the total of shopping cart. If you are not sure what sizes you should pick, you can find out more through our Size Guide on the product page. If you bought your product at Sportzone or another store which sells official Sporting Clube de Portugal products, you can personalise your items at the Loja Verde Official Club Store in Estádio José de Alvalade. We will not stamp any items which are found to be counterfeit. Yes, the letters and numbers used for Customization are the same as those used by players, except in Liga Portugal games. No, only items which have the customization option on the product page can be customized. You can use Paypal, Visa or ATM Reference. The 10% is available for Members whose have fees paid up to date and will not be applied if fees are in arrears. The discount is not valid for products already in promotion and is not cumulative with other promotions/discounts. First you have to register. Registration for the Loja Verde Online Store is shared with the registration for www.sporting.pt, so you only have to be registered on the website to log in to the Online Store. When registering you should provide your member details: member nº and last 5 digits of your Member card. You can then log in to the Loja Verde Online Store and your member discount will be automatically applied if all fees are paid up to date. If none of the above apply, please contact us at apoiolojaonline@sporting.pt. For international shipping, we only have one delivery modality, with the transit time depending on the destination. To find out more about our shipping conditions, please read our Shipping Conditions. Transit time depends on the destination country. Please read our Shipping Conditions. * Orders paid until 3pm are dispatched on the same day. Yes, we can deliver in over 100 countries around the world. No, currently orders made in the Loja Verde Online Store are delivered to your indicated address or to a pickup point, you cannot collect it in the Official Club Store in the stadium. Yes, If you still haven’t paid. If you give up of your order after payment, it will still be shipped to the indicated delivery address. As soon as you receive the order you can return it, as long as the product can be returned, has not been used and is in its original condition. No, it is not possible to change the delivery address. You should always review the address that you enter as delivery address, as well as the billing address. If you are not available to receive the order at home, you can also provide the address of the place of work. You can only change the address directly with the carrier, accessing the link sent via SMS and / or E-mail that you will receive. At that moment, the order will already be in the possession of the transport company. You can track your order through the tracking number that will be sent via SMS and / or E-mail by the carrier. This tracking number is provided by the carrier Chronopost, and is a number that identifies your order and allows you to track the location of the order. You can follow up by entering the tracking number here. No, deliveries are made on business days between 9am and 6pm, with a delivery deadline from 1 business day from the day the order is picked up from the warehouse by the carrier. The delivery time depends on the destination address. On the day of delivery, you will be informed of the time window in which you will receive the order. If you are not in the address indicated to receive it, you can change the address and / or the day of delivery by accessing the link sent by the carrier via SMS and / or E-mail, or directly contact Chronopost with the tracking number of the order. Delivery dates are estimates and are the responsibility of our shipping company and not of Sporting Clube de Portugal. These dates can change, but we will do our best to provide accurate estimate and to provide our customers with tracking numbers that can be used here. If the information provided through the tracking service indicates that the order has been returned or the address was incorrect, then orders are considered as not delivered. If no information is available or if it has been considered as not delivered, please contact us at apoiolojaonline@sporting.pt. If the products do not correspond to your order or if they have defects, please contact us at apoiolojaonline@sporting.pt to explain what has happened. We kindly request that you also send us photographs of the product so we can respond quickly. When contacting with our customer support, please always provide your order number so we can identify your order more easily. If your order is damaged when your receive it, we recommend that you refuse delivery and ask shipping company to return it to the sender. Then please contact us at apoiolojaonline@sporting.pt to report the situation. Please also remember to provide your order number. If you refuse delivery, tracking will show that it is going to be returned to Sporting Clube de Portugal. If you still haven’t informed Sporting Clube de Portugal that you have refused delivery, please do so via apoiolojaonline@sporting.pt, indicating the reason for refusing delivery and that you want to cancel the order. This will make it easier for Sporting Clube de Portugal to process the order. Orders will only be shipped on workdays (Monday to Friday from 9h00 to 18h30), excluding public holidays. For payments made by credit card, payment should be confirmed until 23h59otherwise orders will be shipped on the following workday. When you access your shopping cart to finish your order you can provide different billing and shipping addresses. Yes, under Decree Law nº 24/2014 of the 14th of February you can exchange or return any product purchased from the Loja Verde Online Store. Requests must be made within 30 days counting from the moment you receive your order. Products must be returned in the exact condition in which they were shipped to the indicated address and all items detailed in point 11 of our Terms and Conditions must be fulfilled. If your product is not the size you wanted, you can exchange the product for a different size or another product for the same or higher price. After receiving the unused product in its original condition at our warehouse, we will exchange the product. Photograph of the product if it has a defect, clearly identifying the defect. 2. Within 24h we will confirm that we have received your request, indicating the availability of the item to exchange. 4. The cost of shipping items for exchange to our warehouse is the responsibility of the customer. 5. Once we receive the product in our warehouse, we will confirm that it is in the correct conditions and send the item chosen for exchange. 6. The cost of shipping the new products will be the responsibility of Sporting Clube de Portugal. 7. Should exchange be requested due to a defect, the costs of sending the product for exchange and delivery of the new product will be the responsibility of Sporting Clube de Portugal. If you are not satisfied with an item, you can return it. After analysing the unused product, we will proceed with a refund of the cost of the order. 1. Complete the return form – download here – and send it to apoiolojaonline@sporting.pt within 14 days counting from the day your receive your order. 2. Within 24h we will confirm that we have received the request by email. After we receive the form, you have 14 days to return the products to Sporting Clube de Portugal. 4. The cost of returning products for refund will be the responsibility of the customer. 5. Products must be returned in the exact condition in which they were shipped to the indicated address and all conditions detailed in point 11 of our Terms and Conditions must be fulfilled. 6. After confirming the conditions detailed in point 5, we will refund your order within 14 days, with a digital gift voucher. Should you require another form of refund, this should be communicated to apoiolojaonline@sporting.pt. When exchange results from a defect to a product sold by Sporting Clube de Portugal, the club will cover the costs of sending the new product (return of the product to be exchanged and the sending of the new product). When the exchange is made on request of the customer and in cases in which no product defect is detected, or through error in choosing products which is not attributable to Sporting Clube de Portugal, the costs of return of the products for exchange will be the responsibility of the customer and the cost of sending the new product will be covered by the Club. Our first method of refunding is through a digital gift voucher. Should you require another form of refund, this should be communicated to apoiolojaonline@sporting.pt. If you have requested an exchange, the new product will only be dispatched after we receive the original item at our wharehouse in the conditions detailed in point 11 of our Terms and Conditions. Products will be exchanged or refunded only if they are in the exact original conditions of shipping. Returned products must contain all items which they are composed of (accessories, manuals, tags, packaging…). Any damaged items which were not in such a state when delivered or which have signs of incorrect use beyond the opening of packaging will not be accepted. No, exchanges and refunds can only be made by contacting apoiolojaonline@sporting.pt. No, we do not exchange or refund products which have been customized. You can register by clicking in the link Customer Area link the top right corner of the webpage. Your registration will be stored on the domain www.sporting.pt and you will be redirected to this website to complete your registration. If you are member, do not forget to fill in your member details to benefit from a 10% discount in the Loja Verde Online Store. If you are already registered on the website www.sporting.pt, you only need to Log In to the Online Store. Yes, simply enter into your Customer Area. You can change these details in My Account. In the Login area click on the Recover password link and follow the instructions. Yes, you can review your previous orders in your Customer Area after logging in. Yes, the letters and numbers of the Personalisations for supporters and members are the same as those used by the players, except in the games of Liga Portugal. How do I participate in Loja Verde Online Auction? What is the maximum and minimum amount that I can bid? Is it possible to cancel or change the value of a bid? How do I know if my bid has been submitted? To bid, do I have to login? How do I know if a higher value than my own has been submitted? Can I make an automatic bid? Do I have to wait until the last few seconds of the Auction to get my bidding to be the highest? Once the time indicated for the length of the auction is over, how do I know if I am the winner or not? If I am the winner of the auction, can I use the member discount on the final value of the product? If I win the auction and I do not want the product anymore, what do I do? If I’m added to the list of blocked users, how long will it take until I can return to participating in auctions? If I’m the winner of the auction, how long does it take me to receive the product? What payment forms are available if I’m the winner? Is it possible to exchange or return a product won in an auction? Does the final value of the auction already include the shipping costs? I won an auction, can I customize the product? Can I choose the size of the product I won at the auction? How many units will I receive from the product I won at the auction? Is it possible to track my order during delivery? To participate in an Auction, you must register with the Green Online Store, or if you are already registered, just log in. When entering the page of the product that is being auctioned, you must click on "Bid", so that later you can enter the desired value, depending on the amount previously submitted in the auction. ATTENTION: THE BIDDING IS A BINDING PAYMENT COMMITMENT IF YOU ARE THE AUCTION WINNER. No. All bidders that are registered and logged in to the Green Online Store may participate. The auction page will indicate the value of the next minimum bid, and you may offer a higher amount, as long as it is within the range of bids allowed. No. The bidder may not change or cancel the bid. The act of bidding must always be weighted, because the bidder is bound to pay the amount bid if winner of the auction. You will receive a notification via email after bidding, to confirm that your bid was submitted at the auction. If you do not receive this notification, please contact our Online Store at apoiolojaonline@sporting.pt. - You have the login / registration made in the Online Green Store, because only then will it be possible to carry out the bidding. If none of the above occurs, please contact us at apoiolojaonline@sporting.pt. Yes. In order to be able to bid, it is necessary to be registered at Loja Verde Online and/or, if you are already registered, just carry out the LOGIN. You will receive a notification via email whenever your bid is exceeded. You can also track the bid directly on the Auction page, or in your Client Area. No. It is not possible to perform an Automatic Bidding, that is, to offer a maximum bet amount that is automatically managed by the platform during the Auction period. Whenever you want to bid a higher value than the existing one, you must do it at the time and keep track of betting progress until the timer reaches 0. No. Whenever a bid occurs during the last 3 minutes of an auction, the timer will be updated to 3 minutes again. The auction ends when no further bidding has taken place in the last 3 minutes. You will receive a notification via email at the end of the auction, informing if you are the Winner or if you will be staying for the next opportunity. No. Membership discount, member's anniversary discount, and other discounts or campaigns in force are not cumulative with an Auction product because it is a unique product, as the maximum amount being limited at the end of the auction is the final amount stipulated for the product. The bidding is a payment commitment that must be respected seriously. When making a bid, the winning bidder undertakes to pay the product if his bid is the highest one. In case he no longer wants the product, the Anti-Game System will be activated which will lead to the blocking of this user for a time to be determined by Sporting Clube de Portugal. During this period, the user will be prohibited from participating in the Green Store Online Auction platform. If you are inserted in the list of blocked users, you will be informed by the Green Online Store Team, how long you will be blocked and when you can re-take part in the auctions. To avoid blocking participation, when setting the value of your bid, keep in mind that if you are the winner, you will have to pay that ammount. Sporting Clube de Portugal will contact the Auction Winner to provide more information about the delivery process. Payment of the auction won is made through the Loja Verde Online platform through Credit card, ATM (for Portuguese bank accounts) or PayPal reference. Payment must be made up to 3 days after the ending of the auction. No. It will not be possible to make exchanges or returns of auctioned products. Being these exclusive, when participating and winning the auction, the bidder undertakes to purchase the product, accepting it cannot be returned or exchanged. Shipping costs for auction products are free, regardless of the country and the final value of the product. Auction products are not customizable because they are exclusive products. This applies either before or after the Winner purchases the product. Each auctioned product is unique, only existing 1 unit. It is not possible to choose the size, unless indicated otherwise. You will only receive one unit of the auctioned product. Each auction corresponds to just one product, one size, and one unit. Yes. You can track your order through the tracking number that will be sent via SMS and / or E-mail by the carrier, so you can identify and track the location of the order. You can follow up by entering your tracking number here (nacional) or here (international).